Based on Ubisoft's impressive PC shooter, Far Cry Instincts has been retooled and revamped exclusively for the Xbox with a deeper storyline and additional features. The game remains impressive and mixes traditional FPS elements with stealth action, supernatural abilities and more. The game's graphics engine looks like it will come surprisingly close to matching the beautiful visuals seen in the PC version. However, the most impressive aspects of the title are its innovative mix of stealth, action, and expansive environments that allow for emergent gameplay to give players an incredible amount of freedom. Far Cry impressed many PC owners last year, and the tweaked Xbox edition looks like it will be even better the second time around. Set on a remote tropical island in the South Pacific, Ubisoft's Far Cry Instincts has players in the role of Jack Carver who's been stranded there after a plane crash. Initially, the island seems like an isolated subtropical paradise, but Jack soon discovers that the island is crawling with mercenaries who seem to be hiding something. Once they discover his presence on the island, they begin an all-out assault to capture or kill him, to prevent him from finding out the islands secrets. The adventure begins on the shores of the island, but players will quickly find themselves trying to survive in the jungles deeper inland. This is where the game should truly set itself apart from other FPS titles. While Far Cry Instincts is based on the PC version released last year, Ubisoft is promising a number of improvements that should make the game even better. The characters and events in the PC version will be further elaborated on in order to give players a greater sense of the storyline. There will also be a number of new abilities such as being able to throw rocks to distract enemies without setting off a massive counter-attack. As you'd expect from a FPS title, Jack will have access to a variety of standard weapons, such as machine guns and pistols to kill enemies, but this just barely scratches the surface of the survival tactics available to him on the island. While he doesn't have much to defend himself with initially, he can take weapons from the mercenary camps, using their own tools to kill them. These weapons are incredibly powerful and sophisticated, allowing him to kill enemies from great distances. Since the mercenaries will immediately go into attack mode when one of them is felled, these long-range attacks give him a head start. Using these sniper attacks let him disappear into the jungle before they can reach his location. Gaining a head start is crucial because the enemies are quite intelligent and use complex tactics in battle. The developers have given the enemies what is called the FAR, or Full Action Response AI system. Once they've become aware of your locations, they'll react with coordinated strikes that can come from any direction. There are a number of enemy types including snipers, stalkers, scouts, and grenadiers who can attack you from any distance. They can use the islands different angles and terrains to find your location. 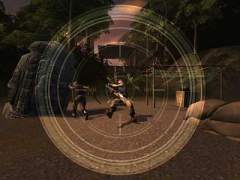 The player will be challenged to outsmart the mercenaries and can attack them in a number of ways from land, sea or with the vehicles. This open-ended, emergent gameplay approach gives you a great deal of flexibility in the method and tactics you'll use to complete each mission. This makes Far Cry Instincts more unpredictable than most other FPS titles on the market, giving players an incredible amount of freedom. At certain points, Jack will also need to battle these mercenaries up close, and can sneak up behind them and use his knife. In order to survive, Jack will also need to use the environments to conceal himself from unknowing foes. For example, he can use the dense forests to hide behind, climb trees and more. The environments in Far Cry Instincts are fully interactive and he use this to his advantage to make his attacks less predictable. He has the ability to swim can go underwater, look up at an enemy at the shore, then leap out of the water, grab them and slice them before they can react. The environments themselves can be used as weapons, and you'll be able to set brutal traps to kill any mercenaries that get in your way. You can set tree branches to snap when a trip wire is pulled, immediately disabling an enemy. In addition to running around, Jack can also use a variety of vehicles to traverse the island. 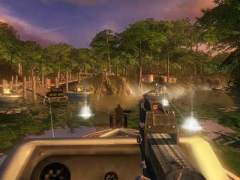 Far Cry Instincts will also include a number of driving sequences, which look breathtaking in their realism and intensity. While driving, you can shoot through your window at opposing vehicles, turn and shoot while driving and use the vehicle itself as a weapon against these enemies. Something changes inside Jack after he's been on the island for awhile. After being injected with a mysterious substance, he finds himself transformed with superhuman strength and abilities. He can lock onto an enemies' scent, and perform predator attacks. He can also develop other abilities such as running incredibly fast. He can also perform a variety of what are called Feral Attacks, cutting enemies quickly with his bare hands. As the game progresses and you explore deeper into the game, Jack will transform into ever stronger versions of himself. 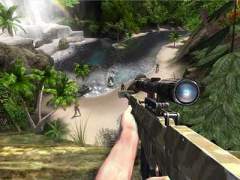 The single player game looks quite intense, but Far Cry Instincts will also feature a surprisingly robust online mode. The biggest feature here is the ability to create your own maps, then download them and share them with other players online. The game's map editor feature looks quite powerful yet easy to use. Players begin their map with an open area and can map the terrain, changing elevation and basic layouts to make an ideal level. The next step is to add vegetation and plants to the island, and finally, players can test their level out before locking it in. In addition, there will be a number of cool multiplayer modes including traditional Deathmatch and Team Deathmatches plus a capture the flag modes. From a visual standpoint, the game looks to push the Xbox hardware to its limits. As stated earlier, the game's environments are truly impressive and the massive scale of the island environments is breathtaking. 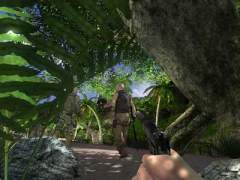 Realistic trees, water effects, bushes, beaches, and dense jungles all create a cohesive, realistic environment. The weather effects also look impressive, with the time of day changing from day to night, to dawn and dusk. Obviously, the lighting will play a key role in your stealth tactics, and the attention to detail in shadows is already looking impressive. The character animation looks especially impressive, each looking and reacting realistically to the events in the game. The massive environments are fully interactive and create an excellent sense of scale and space. Far Cry Instincts' highly polished engine will provide an almost cinematic feel to the action as you switch from on-foot, to in-vehicle to stealth modes. The high polish extends to the weapons as well. Each weapon will look and feel authentic, giving Far Cry Instincts' arsenal a realistic feel. Players will be able to view the action from a variety of viewpoints, with standard first person modes complimented by impressive sniper modes where they can view the action from a safe distance in an incredible amount of detail. From an aesthetic standpoint, the game should be beautiful, with the island giving off a deceptively tranquil appearance that hides the dark secrets within. At this point, it looks like Far Cry Instincts will be one of the best-looking Xbox titles to date. Far Cry's mixture of brutal action and stealth elements should create a tension and realism in the gameplay that few titles on the market have even attempted. 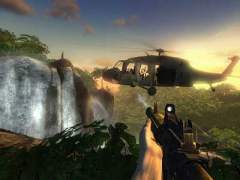 The game's visuals are stunning in their beauty and detail, but the most impressive aspect of Far Cry Instincts lies in its unique, innovative gameplay. Players will have a great deal of flexibility in the tactics they'll use in each mission, with the interactive environments, stealth and attack modes, close and far ranged attacks and tactics that will give players a choice in how to attack enemies. However, the sophisticated AI of these opponents means they won't be pushovers, and will in fact, be smarter and less predictable than foes in most games. Solo players should find an incredibly immersive experience unlike any other on the market, but the game's deep online modes, map building abilities and all-out deathmatches should please Xbox Live players as well. Far Cry Instincts is looking to be one of the most impressive Xbox titles to date, and looks to redefine the genre with a unique hybrid that integrates FPS and stealth genres into a single brilliant title.